No current series comes close to "The Simpsons'" mark. For many years, Gunsmoke has held the record for most episodes in a scripted TV prime time series. 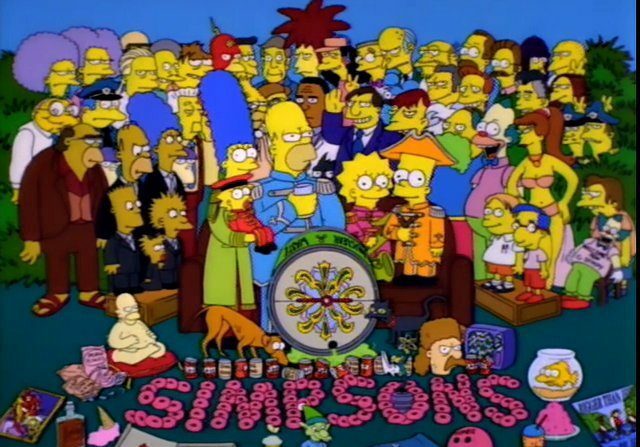 Next year, after 29 years, The Simpsons will take that record and likely keep it for good. By announcing its 29th season, Fox gave The Simpsons the green light to overtake the longtime running western for most episodes in a scripted TV prime time series. The Simpsons will sit on 618 episodes after their 29th season finale this Sunday. Gunsmoke, which went from 1955 to 1975 had 635 episodes so The Simpsons will probably take the top spot somewhere around March 2018 given their schedule in previous years. This is a pretty massive achievement that probably won’t be matched again. For instance, The Simpsons had to average over 20 episodes a year for 29 years to get to this point. With network sitcoms and 25 episode seasons going out of favor for cable and streaming shows that seem to average half that, it’s becoming less and less common for TV shows to have more than 100 episodes, much less 600. There’s also the very likely scenario of actors wanting to do other things and a fear of declining quality that would keep even the most successful show from going even a third of what The Simpsons is doing. The current top 10 (excluding anthology shows with different casts) prime time scripted shows are Gunsmoke (635 episodes), The Simpsons (618), Lassie (547), Law & Order (456), The Adventures of Ozzie & Harriet (435), Bonanza (431), Law & Order: Special Victims Unit (407), My Three Sons (380), Dallas (357) and Knot’s Landing (344). In terms of current shows, nothing comes close to The Simpsons. Even SVU, which started in 1999, is 200 episodes behind. NCIS (329 episodes), Grey’s Anatomy (293), Family Guy (287), Criminal Minds (277) and Supernatural (264) are current shows high up the list. If any show were to come close to passing The Simpsons, it would be Family Guy. They have been noted for copying many things from The Simpsons over the years anyway, may as well go for their impending record. Just need The Simpsons to end and go another 14 years after that to catch up. So that might take a while.